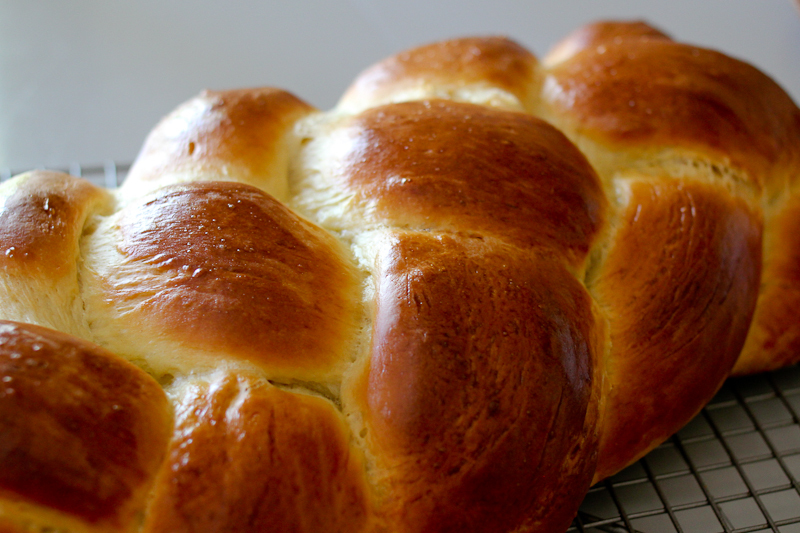 I get so many compliments whenever I bring Challah to a social event. I’m almost embarrased to share with you what people tell me, because you will think I am making it up. Seriously. If you follow these steps, you will soon be receiving your own compliments. And I would love to hear from you when you do! The recipe is adapted from my time at Tante Marie’s cooking School in San Francisco. I always use my Kitchen Aid with the hook attachment to knead dough. 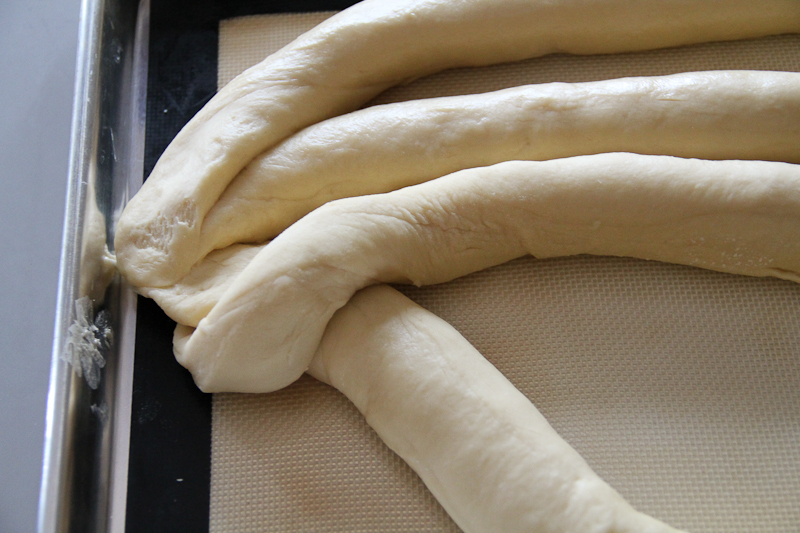 You can knead the dough by hand as well, it will take a little longer. Dissolve the yeast in the water and add all the remaining ingredients. 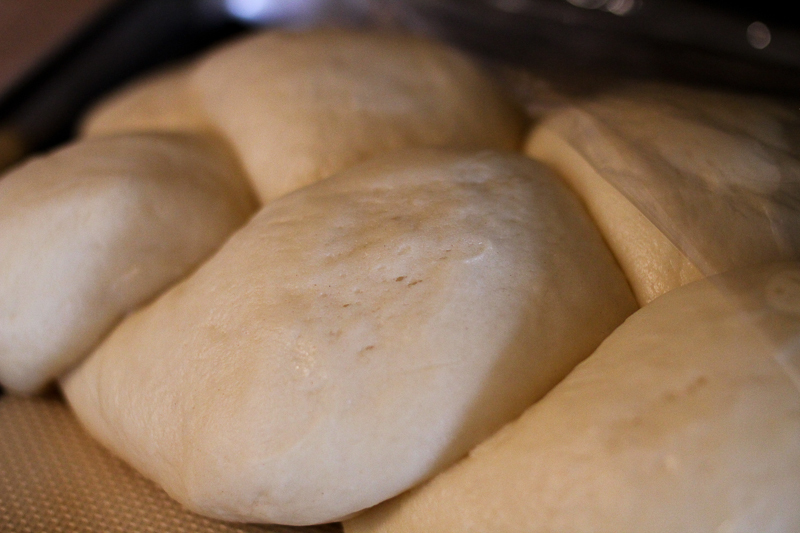 Knead with the dough hook for 6-8 minutes until the dough is smooth and pliable and comes off the sides of the bowl. If kneading by hand do so for about 10 min. 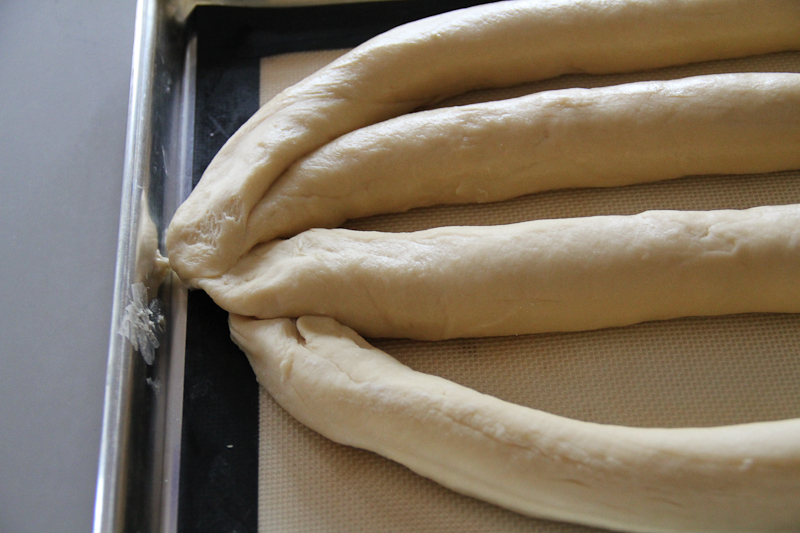 Let the dough rise until doubled in size. About 1.5 hrs at room temperature or overnite in the fridge. 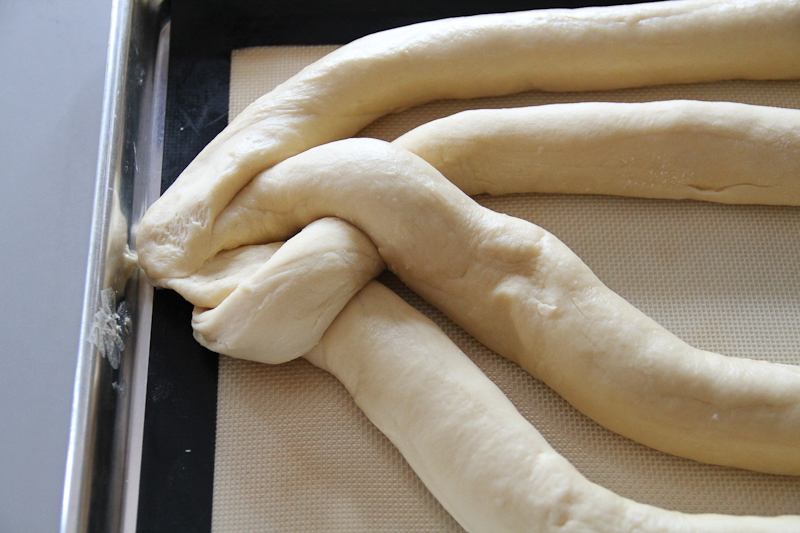 Punch the dough down and divide into 4 equal parts. 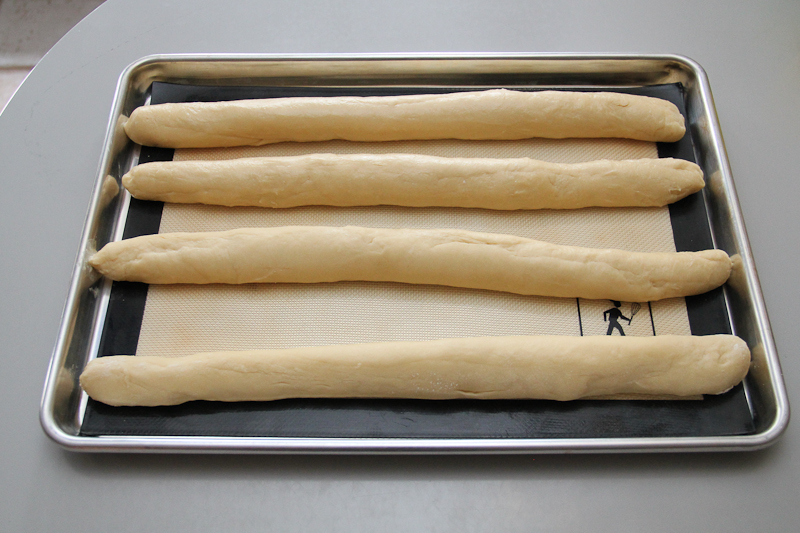 Roll each part into a log the length of your sheet pan. I use 1/2 sheet pan. 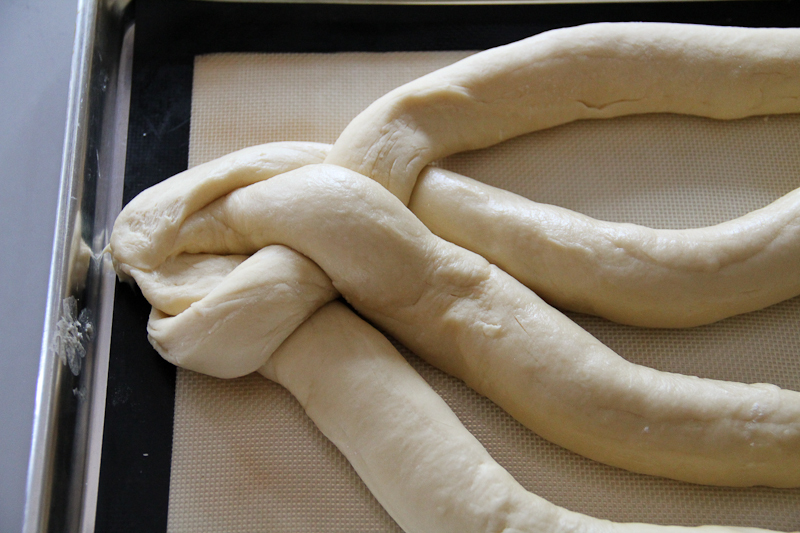 Gently squeeze the ends together. Then start braiding by taking the log closest to you Under Over and Under the other logs. Repeat with the log now closest to you Under Over and Under. 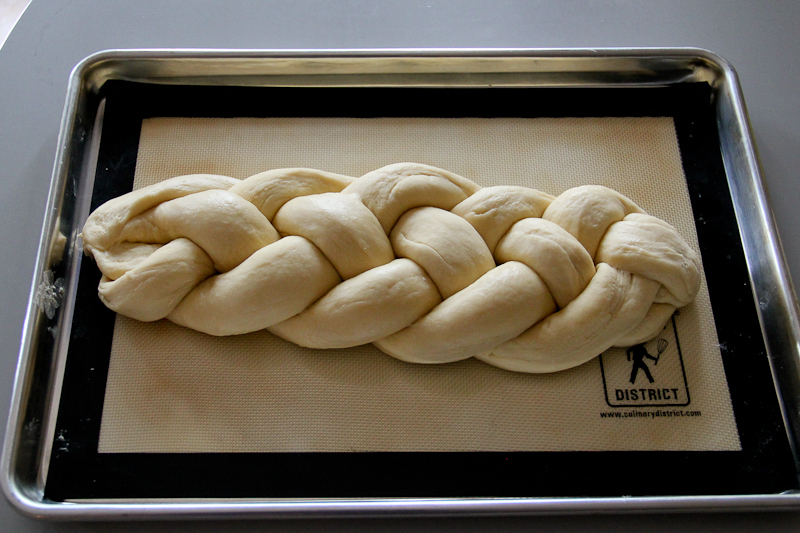 When you are done braiding, squeeze the ends together, cover with plastic wrap and let the challah rise until you see tiny pockets of air. About 1 hr, but it depends on the room temperature. See picture below. Crack the egg in a small bowl and whisk well. 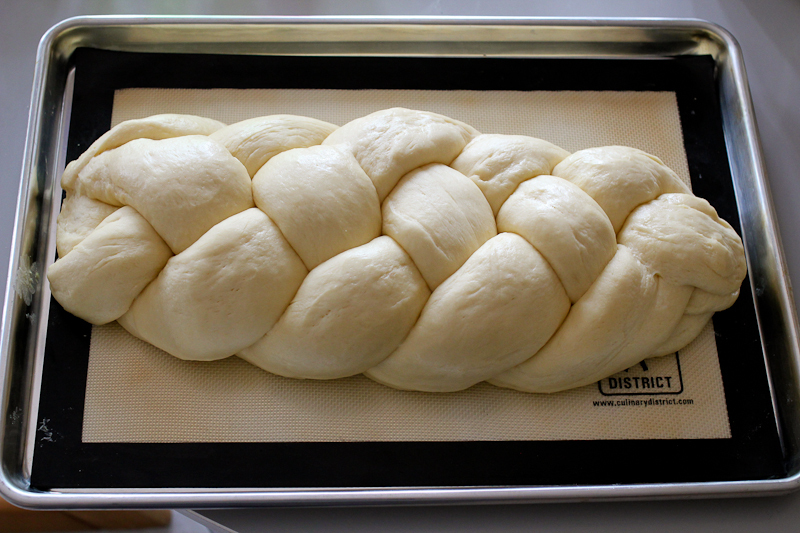 Gently brush the challah with the egg glaze. Be careful not to deflate the bread. Bake for 40-45 min until golden brown and hollow sounding when tapped on the bottom. Cool on a wire rack. 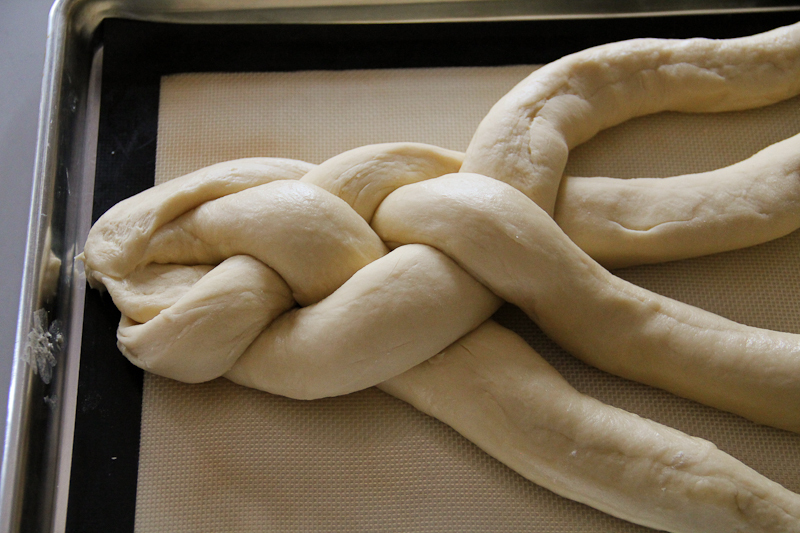 This entry was posted in Breads & crackers and tagged best challah, braid with 4 strands, challah bread, challah recipe, flet med fire, four braid. Bookmark the permalink. Må fluks prøve den – ser mægtig lækker ud Du fortjener hvert og et flaterende kompliment! My spouse and I absolutely adore your blog and locate nearly all of your posts to be exactly what we’re seeking for. Would you offer guest writers to write content material within your case? I wouldn’t mind publishing a post or elaborating on quite a few the subjects you write related to here. Again, awesome weblog! Thank you so much. I really appreciate your positive feedback!! And to answer your question, sure I would certainly consider guest writers. Do you have anything specific in mind or a quick, healthy , tasty and easy dish you would like to share? You can reach me at foodyear@gmail.com or simply reply to this comment. Looking forward to hearing from you. PS I had to edit your comment slightly, some strange signs had sneaked in. Hope it appears as you wrote it. Best bread EVER Så er der endnu et Challah bread på dagens program.